The New Testament is designed to guide our relationship with God and behavior toward others. This completed edition is the result of 42 years of labor translating NT Greek into a common devotional language. It is a candid rendering in chronologic order by books, in 5 sections. This text is true to the original language, but easy to read and understand. Scripture means exactly what the first person who heard it understood it to mean; not what culture, tradition, or translators interpret the words to mean. Getting a sense of the original intent provides an improved devotional understanding of the inspired text and will enable believers to remain Evergreen with daily renewal. Actually, my wife uses The Evergreen Devotional New Testament daily in her devotional study time. I use it as my first reference text for New Testament scriptures, in the preparation of sermons and Bible studies. Some of our young members acquired their personal copies, which they use and bring with them to fellowship services. In study recently, I was particularly challenged by the comments and accompanying question found at the end of the Book of Acts. I found that the explanation given for the apparent abrupt ending of the Acts of the Holy Spirit through the lives of the apostles and other believers most insightful. The idea that it was assumed that all believers and local churches are to continue writing the history of God working through individuals empowered by the Holy Spirit bore a sobering impact in my heart. The question was then asked: What has God done in your life or place of worship lately that is worthy of recording in such a book Indeed, a compelling and convicting wake up call for us believers. The Evergreen Devotional New Testament is recommended to all students of the Word. The Evergreen DNT is a succinctly stated modern translation that synthesizes information with informality. The translation is conversational, devotional, and straight-forward; it appeals to a wide audience and has an ability to spark dialogue. The DNT is reflective of 21st Century craft aimed at combining permanence and freshness with a drive towards futurity. I highly recommend this rendering of the New Testament to any bible student. Great for Devotional Reading. So easy to understand. I have been studying the New Testament for over ten years , and I have many versions ( King James , American Standard , NIV , Greek Word Study , New King James , CEV , ...etc. , the list goes on). I have read 121 pages of the volume this week and have already found answers to questions that I have had for ten years. As Dr. Green states in the preface to this devotional New Testament rendering... ("Originally the letters and books that make up the New Testament were read publicly without explanation and passed on to another congregation. The listeners understood the language without explanation.") That is what you will get out of this book, you will be able to understand the New Testament like never before. The devotional testament is written in understandable language...check it out! I have been reading The EVERGREEN Devotional New Testament for three weeks and have learned more about the NT that ever before. I didn't know that Luke wrote Acts; I though Paul wrote Acts. The front and back material is so helpful. Although, there are only a few notes, they are important. Mostly, I enjoy reading the DNT; it is so smooth and graceful. The best part is that I clearly understand each verse and paragraph. I use to use 10 to 12 books to assist in preparing a sermon, now I simply study a section (paragraph) in the DNT and construct my message. I still take my KJV to the pulpit and read a text, but my study is in the DNT. In fact I have changed my wedding ceremony scriptures to the DNT and use it when I place scripture on FaceBook. 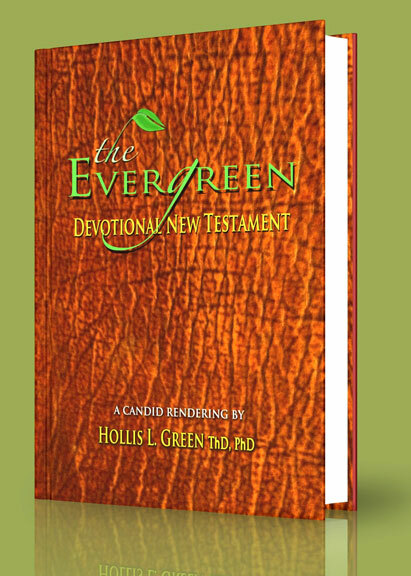 The Evergreen Devotional New Testament is an amazingly thorough work of over 40 years of biblical research by Dr. Hollis L. Green, a biblical scholar, author, lecturer, preacher, and professor. Dr. Green displays a strong command of the Greek language, which in turn gives an accurate translation of the Scriptures. This devotional format of the New Testament enhances biblical study by providing an easy to understand application of Scripture to one's life, and it is an excellent tool for study for individuals, for small groups, and for congregational use. I chose to use the Evergreen Devotional New Testament version in my last book where I quoted Scripture for the clarity it provides. From the lay person to the biblical scholar, I recommend the Evergreen Devotional New Testament to open up new understandings of God's Word and to enhance spiritual growth in applying the New Testament to one's life through the continual study of the Scriptures. There are many laudable efforts at presenting the Holy Scriptures in a more easily understood and palatable format. The Evergreen Devotional New Testament account stands out amongst this group as one that has been able to manage the balance of retaining the sacredness of canonical reference while bringing the historical plot to life. In most popular biblical translations, the placement and format of Book, chapter and verse are so structured that the message is somewhat disjointed and the reader is forced to stop after every few verses. This DNT; however, truly narrates as a dynamic storyline rather than fragmented passages. While there is some value in meditating on and highlighting verse by verse, this often leads to misinterpretation and misuse of scripture. The Christian community has unfortunately been more concerned with locating and identifying specific scriptures that fit situations or needs rather than capturing a theme or a message in which to align one's life. In Dr. Green's DNT, notation of chapter and verse is placed only as background references while the narrative continues as the point of focus and engagement. With a more seamless flow of communication, Green allows the reader to grasp the true intention of the authors and to better visualize the context being described. Green recognizes that there is a real story behind and beyond the words, and this is what he has been successful at bringing across; Enlightenment of and immersion in the true and living Word of God. Purpose known and pursued affords us the joy of fulfillment for it transforms work from mere employment to deployment. The Evergreen Devotional New Testament fits that description. That the translator was driven by desire to impress on the readers the original intent of the New Testament is most commendable. Information in the Prologue, Introduction and Appendices should be common knowledge to all who study and teach the Bible. Further such persons should have the Evergreen Devotional New Testament as a major tool in their study arsenal. (Please note I did not say library). Thanks for producing The EVERGREEN Devotional New Testament, I have started reading it and can see that I will treasure it. I can see that many people will be blessed by it. I am still reading your Evergreen Devotional New Testament. I can well see how useful it can be to people who have trouble with understanding other versions of the Bible, and you have certainly used 42 years of your life wisely. For my part 80 years or so reading King James has left me with enjoyment of its English, quaint and idiosyncratic as it may be, but Evergreen makes me realise that though I enjoy the English of KJV, there are quite a number of passages which I read without real understanding and reading Evergreen can help then. So thank you!.